Birmingham has changed more in the past 30 years than just about any other city in the UK, and regeneration and development is showing no signs of slowing down. New areas of the city are being opened up, leading to positive changes across the region. Birmingham’s central business district and core office market have received significant investment over the last 5 years. Modern office space is attracting new businesses to the city, including some of the UK’s biggest financial institutions, such as HSBC and Deutsche Bank. Demand is growing in Birmingham, and combined with the increase in high-quality office space, we can expect to see rents increase to £35 per sq ft by the end of next year, which is excellent news for Birmingham property investors. Birmingham is seeing highest demand from Technology, Media and Telecoms (TMT), which now represents around 20% of all new property deals. We are also expecting to see growth from the Fin Tech, Media and Biomedical sectors, and this will lead to a rise in professional and financial services. Although the Brexit referendum has slowed business slightly, demand was already running at unprecedented levels and the occupier market continues to hold steady. Yields for prime office space should stay at around 5.25%. Birmingham continues to attract significant overseas investment, which is generating increased demand. Birmingham is attracting buyers from London who tend to have higher expectations. As a result, developers are building higher quality apartments and taking more care to create more desirable environments around developments. Birmingham’s build-to-rent sector is expected to supply 55 new units every year in the city centre by 2020, placing Birmingham as the country’s leading Build-to-Rent investment zone. Birmingham’s demographics are also changing, with a growing younger population, attracted by the affordable housing market and improved career opportunities. 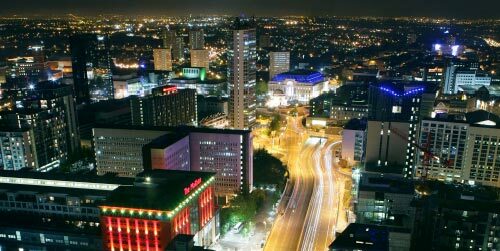 There are around 1900 international businesses in Birmingham, and the city boasts the largest professional service sector outside of London. Birmingham’s commercial and residential hotspots are being supported by infrastructure improvements and city centre regeneration, which is making the city more appealing to businesses and families alike. We predict that rising demand will push prices to £500 per square foot in prime city locations, making Birmingham ripe for investment.